Prince of Wales College, Moratuwa commenced cricket in the year 1896 under the guidance of J G C Mendis with the first captain being J G Fernando. Prince of Wales College was founded by one of the greatest philanthropists in the island Charles Henry de Soysa in 1876 and in the same year as a cricket lover he introduced this noble game to the college and members of the staff participated. The 13th February 1897 was a red letter day for Cambrian Cricket when they took on Royal College, Colombo at their grounds at San Sebastian Hill, Pettah and Royal thrashed Cambrians by innings and 247 runs. Their second game was with Wesley College and third being St Thomas College. Year by year they extended the fixtures and it is sixteen games for a season now excluding the Big Match and limited over match against their arch rivals St Sebastian's College. Cambrian Cricket could be divided into two, pre-war and post-war. Even during the World War II the school and the grounds were taken by the Britishers but cricket was played without an interruption. During this 117 year Period Prince of Wales has produced several cricketers of calibre and few names coming to mind in the pre war period are D H L de Silva, O L F Senaratne, M J Fernando, W O de Silva and G P de Silva. O L F Senarathne is the first Moratuwite and the first Cambrian to play for the then Ceylon in 1926 against India. When it comes to post war period there were umpteen number of cricketers but the few names that come to mind are Paul Devadasan, H I Fernando, T G M Perera, Stanley Fonseka, Nisal Senarathne, Stanely de Alwis, Lasantha Rodrigo, Sarath Fernando, Hemal Mendis (Jnr), Lloyd Paternett, Wirantha Fernando, Pemalal Fernando, Lantra Fernando, Sahan Wijerathne, Hayasti Aponso and Roy Cooray. The Test players are Granville de Silva, D S de Silva, Amal Silva (later St Peter's), Chaminda Mendis, Hasantha Fernando, Darshana Gamage and Lahiru Thirimanne (who toured Australia with the national team). This year Cambrians are being coached by Suranga Wijenayake and his assistant is Nalinda Dissanayake both Cambrians. The Prefect of Games too is an old Cambrian Susantha Mendis and Master-in-charge is G H T Kavinda. The Principal Sampath Weragoda is extending his fullest support not only to cricket but to all games of the school. This year Cambrians are being captained by former under 15 Sri Lanka Schools Skipper and Member of the under 17 Sri Lanka Schools team and third year coloursmen Kusal Mendis. Undoubtedly Kusal is the most experienced opening batsman in the schools today. He is the stumper of the team and opens batting with another second year coloursman Suchira Fernando. 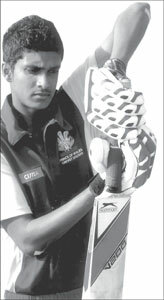 Kusal scored two centuries against Mahinda and St Thomas and so far collected more than 450 runs. He is a batsman when gets going is treat to watch. Last year he notched up 206 runs and joined the select band of cricketers who scored double hundreds Lantra Fernando, Wirantha Fernando and Nayana Ranjith. Last year he passed another milestone by scoring 1000 runs and joined the thousand run brigade along with H I Fernando, Hemal Mendis (Jnr), Wirantha Fernando, Pemlal Fernando, Wasanthalai Fernando, Crishan Fernando, Nilantha Bopage and Nilantha Cooray. His deputy will be Ashen Mendis a third year coloursman and he bats at number three. He scored 58 against Isipathana Vidyalaya. Suchira Fernando who opens batting with Kusal is a second year coloursman is a safe fielder. He had good scores under his belt with a highest score of 78 against St Thomas. The new ball is shared among Shenal Chetaka and Satchith Pushpakumara and Hasitha Lanka who is also a good all-rounder is a medium pacer. Another all-rounder Shanuka Dulaj who had three half-centuries with the top score of 68 versus Sri Sumangala is a left arm leg spinner. Another second year player Devaka Dabare also an all-rounder bowls right-arm leg spin and capable of breaking partnerships. Jayanga Peiris is another all-rounder coloursman and a second year player bowls right arm off spin and took five wickets each against Richmond and St Peters. Janeesha Fernando is a medium pacer who bowls occasionally. Crishan Aponso is a middle order but who rises to the occasion with the highest score of 66 versus Mahinda. 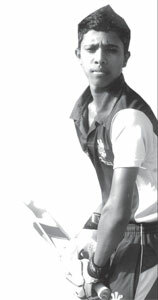 Thilan Nimesh who is fourteen years old bowls left arm leg spin and among the wickets this season. He excelled in the zonal and provincial matches conducted by Sri Lanka cricket. Ravindu Sasanka, Hashan Fernando and Sachin Silva are freshers and trying for places. So far Cambrians have played ten matches and won against Dharmapala, Isipatana and Sri Sumangala and won first innings versus St Thomas, St Peters and drew with Dharmasoka, Maris Stella and Thurstan and went down on first innings to Richmond and Mahinda. This year Cambrians have a well balanced side but none can be satisfied with their past outcome. The cricket crazy Moratuwites are eagerly looking forward for the Big Match and the limited over which will be worked off at Tyronne Fernando Stadium - De Soysa Park their usual venue on March 8th, 9th and 10th against their arch rivals Sebastianites.